Just like for all brides, when the big day is approaching, of course there is so much to remember and so much to do to prepare for it-to make sure your wedding day is as perfect as possible. Since all eyes will be on you as the bride, it is only natural to be stressed out over your gown, your makeup, jewelry, and your hair. It will all come together with time and planning, so try to relax. That said, let's take a look at some of the more elegant bridal hairstyles popular in Dallas you can choose from to help you complete the perfect look and shine on your wedding day as the beautiful bride you were meant to be. 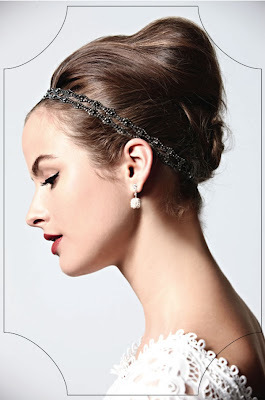 Whether you have short or long hair, there are a variety of options you can use for bridal hairstyles for your wedding. 1. Upsweep: One of the most common ways to style your wedding hair is to choose an upsweep of hair. While this particular hairstyle can refer to a variety of different styles, for our purposes, it is the simple upsweeping of hair at the base of the neck. This is a very elegant style in its simplicity and grace, and can be accented with either delicate or demonstrative hair combs. Moreover, it can be as loose or tight as you prefer. 2. Down: Though often overlooked as a style, wearing your short to long hair down can prove quite elegant, despite the informality usually attached to it. There are a variety of things a woman can do with her hair if left down-curled, waved, or left straight. Whichever you choose, make sure your hair is well groomed so that the beauty of your hair can be accentuated while down. 3. Half up: Half up is another popular choice for brides to be, as it shows off the face, while leaving some hair down for femininity. Your hair can be swept from both sides evenly and secured with a barrette or other decorative bauble, or affixed on the side of your head. 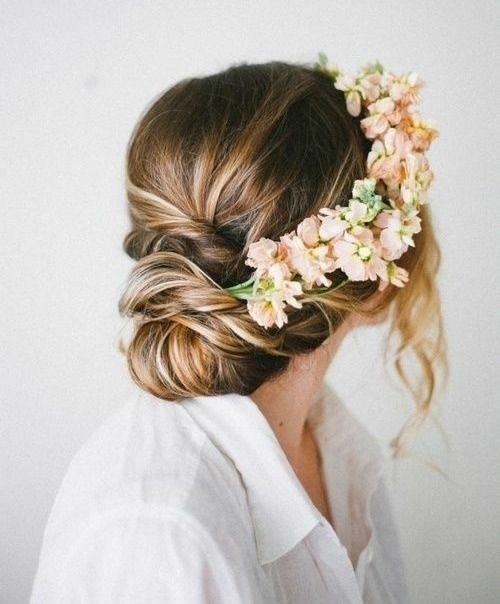 In either event, it is a beautiful way to combine two different hairstyles in one delicate wedding hairstyle..
4. Braided: Whether you choose one simple braid, a French braid, or still smaller braids entwined in your hair-all of them are elegant choices for a wedding day hairstyle. 5. Bun: Though seemingly simple, a bun at the nape of your neck or back of your head can add a beautiful and sophisticated elegance to any type of gown and jewelry you choose, and makes for an easy to maintain wedding hairstyle. 6. French Twist: A fresh twist is a bit dressier than a bun and less simple, but still demonstrates a simple classic hairstyle for any wedding day. 7. Curled: Perhaps you would like to add curls to your hair or define the ones you already have. Whichever you choose, soft wavy curls can add a romantic look to any wedding gown and bride. 8. Straight: If you are looking for a sleeker look-and you have curly hair, you should try the sophisticated elegance of straightening your hair. 9. Ringlets: A very popular choice for many brides-whether they opt to wear their hair up or down, if they have short or long hair is to have ringlets put in. As long as the ringlets are soft and not tight, the look is very romantic and old fashioned. 10. Beading: Once you have decided upon the style for your wedding day hair, you may want to consider beading to intersperse and accent it. 11. Ribbons/headbands: Another option for both formal and more informal looks are weaving and tying ribbons and headbands into your hair for a subtle accent. 12. Flowers: Many brides choose to accent their upsweeps and half up hairstyles with both real and faux flowers. The flowers add a romantic and earthy accent to any wedding gown, and are suited best to outdoor weddings that are less formal.